Short stock strategy is a valid trading style for all types of stock traders or investors. Selling stocks short can be used by daytraders or swing traders. Position traders and active investors could use techniques to short stock for their portfolio as well. Selling stocks short could be a very profitable way to make money on the stock market. Short sell trades are quick, as panic is a much stronger emotion than greed. And you know that stock trading is mainly driven by investors’ emotions. It is possible to use several ways to find opportunities to sell short. It is possible to use fundamental ideas based on several different fundamental parameters. Typical scenarios look for overvalued companies with a high P/E ratio. It is quite easy to create a free market screener for this value. Another opportunity for selling stocks short could be found using stock short interest. Heavily shorted stocks are often shorted for some reason. It is always possible to use technical analysis to spot a bearish opportunity to sell shares. You can make timing of your entry to short trade easier using technical analysis. The knowledge of how to use bearish strategies should be part of your best stock trading system. Here are some tips on how to prepare similar strategies for your system. Timing of entry for sell shares in a bearish trade is hard. Some hints could be provided by fundamental catalysts in a company’s financial numbers. A very interesting possibility to short market sectors is inverse exchange traded funds. They were created to make gains when the index they track is in decline. Unfortunately they are not suitable for positions lasting weeks or months. They have value for daytraders or swing traders only. There is risk of possible underperformance when you want to hold these inverse shares for more than a few days. Read a description of these etfs if you want to use them and trade them more. If you want to sell short some shares then you have to be able to borrow these shares from your broker. So you should select a broker with large inventory allowing you to realize these bearish trades. I personally use strategies selling stocks short a lot. So you can find some examples of how I shorted some stocks on these pages. 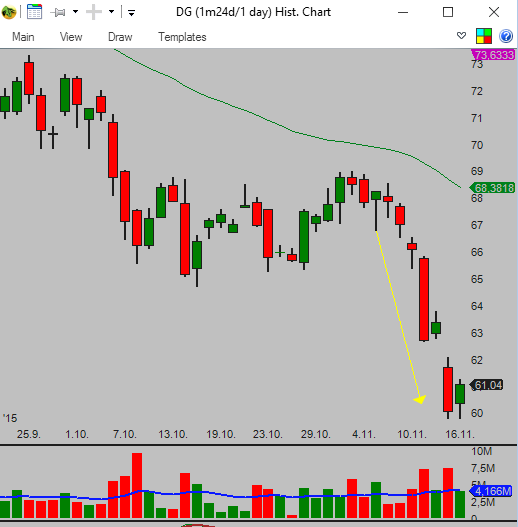 AAPL short sell daytrade could be one example. Some picks for short sell strategies could be based on price gaps. These technical patterns offer huge bearish opportunities for traders and active investors. TCO bearish swing trade is a typical example of using gaps in chart analysis to find a trade opportunity.